In September, a network of hawks from the Christian Right to the neocons held a conference aimed at raising alarm about a purely theoretical threat. Titled “Protecting America Against Permanent Continental Shutdown From Electromagnetic Pulse,” the conference featured speakers who argued that “rogue” states like North Korea and Iran, as well as terrorists, are poised to wreak havoc on the United States by blasting nuclear weapons above the country, releasing an electromagnetic pulse that would shut down much of its infrastructure. 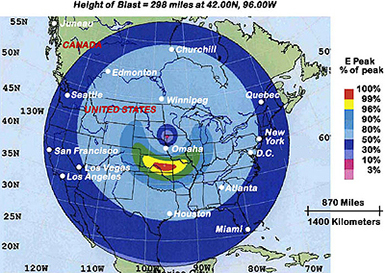 That there is little evidence of EMP’s ostensibly far-reaching impact—or that anyone has developed EMP-optimized weapons—has not stopped hawks from making outlandish claims, like that within a year of an EMP attack, 9 out of 10 Americans would be dead. Despite the hype, it appears that only zealots take the threat seriously. Read full story. Despite challenges to its credibility, the work of this congressional commission continues be cited by hardliners to revive Cold War-era fears of nuclear annihilation and justify aggressive policies toward Iran and North Korea. One of the foremost U.S. experts on counterinsurgency, Nagl is president of the Center for a New American Security, an influential inside-the-beltway think tank with close ties to the Obama administration and neoconservatives. The former head of the Bush administration’s International Broadcasting Bureau, Cropsey has moved to the neocon-led Hudson Institute, where he writes screeds accusing President Obama of “appeasing” the Russians and attacking his efforts at rapprochement with the Muslim world. This longtime foreign policy hardliner is one of a chorus of rightist voices criticizing the recent agreement between Iran and the U.N. Security Council’s five permanent members (plus Germany) regarding its nuclear program. While highlighting on its website that State Department heavyweights Richard Holbrooke and Dennis Ross are cofounders, this right-leaning advocacy group recently ran a TV commercial implicitly criticizing the Obama administration’s Iran policy. Tightly connected to military contractors and to several militarist advocacy groups, this retired general argues that President Obama is naïve about the threat from “radical Islam” and should increase troops in Afghanistan. One of the Senate’s key foreign policy hawks, Senator Kyl recently advocated using U.S. muscle to force “regime change” in Iran. The “godfather” of neoconservatism passed away in mid-September. Experts claim that new intel reports alleging closer ties between al Qaeda and the Taliban, which have been used to promote a full-fledged U.S. counterinsurgency campaign in Afghanistan, are misleading. Days after Barack Obama was awarded the Nobel, two of Washington’s prominent hawks launched a new campaign aimed at depicting the president as weak and pushing militarist foreign policies. Despite strong support for diplomatic engagement with Iran, most U.S. citizens believe such efforts will ultimately fail. On the eighth anniversary of the launch of U.S. military operations in Afghanistan, President Obama spent much of his time deliberating with top advisers on what is likely to be one of the most momentous decisions of his tenure: the future of U.S. involvement in that war. While much of the foreign policy debate has focused on Afghanistan and Iran recently, Washington has been moving to tighten ties with a key neighbor of both countries, Pakistan. Observers are cautiously optimistic that talks between Iran and the five permanent members of the U.N. Security Council plus Germany could lay the basis for a long-sought diplomatic breakthrough. Did the United States really catch Iran trying to conceal its “secret” nuclear facility?